When I mention enrichments you might just think about larger parrots, but parakeets need to have new and interesting experiences too. They are very bright and it’s important to keep their brains active and working on new ideas and objects. 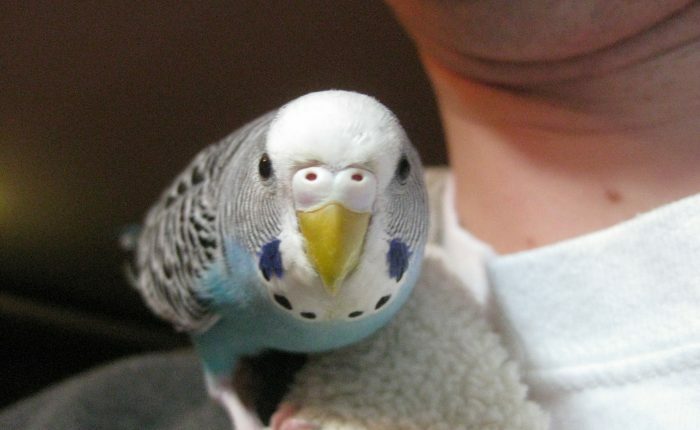 Here are a few of the enrichments that we’ve done with our budgies. Paper Towels or Toilet Paper tubes – some parakeets may happily run right through these whole, but you can also cut them into smaller rings that are run to chew, toss around and drop. Also an empty cereal or oatmeal box can be cut in half for a hideout. Baby teething rings that snap together – (Bright Starts Lots of Links Accessory Toy ) Parakeets will enjoy chewing on the hard plastic and these are great to hang off perches, either alone or changed together. You may even see some ring gymnastics. A ring hung off a perch is also a good brain teaser, figuring out how to slide it off and throw on the floor can be quite a puzzle. Use the floor or a table – changing the venue sometimes makes an old toy exciting again. I also like to scatter some Seed or Pellets around on any flat surface with toys and let then “forage”. Hold a half empty bottle of water sideways, tilt it gently side to side to make a wave. This fascinates my parakeets to no end, and they love to try and go after the drops of water on the inside of the bottle. Throw on a hooded sweatshirt and let them explore your hood and chew your drawstrings. If the sweatshirt has a kangaroo pouch show them the opening and let them go through or think about it. One of our parakeets is tremendously neophobic and won’t really do much adventuring, but even thinking about a new situation is beneficial. A similar approach could be using a folded sheet of paper as a tent, not only is it a pop-up cave but a great opportunity for paper destruction. Foraging food ball (Creative Foraging Systems+E487 CFS Fillable 3-Ball and Kabob Pet Feeder ) – load this up with shredded lettuce or kale and millet, even if you parakeet won’t eat vegetables he’s going to have a fantastic time teasing them out of the ball and throwing them to the floor. You could put any kind of vegetable or fruit in there, they would all be equally fun to get out. window perches – There are hours of entertainment to be had in sitting and watching the world, especially if there are other birds outside! Toby and Kelly both love watching the outdoor birds and weather, expect lots of yelling and watch out for crows and other things that can scare your fids (feathered kids). Vegetables and fruits in new and exciting ways – If you always offer veggies diced, try giving a whole broccoli floret or thin strips of carrots or apple. Play new sounds for your parakeets to learn – We love this R2D2 mix for parakeets that has all the screeching noises removed. Toby and Kelly have to hear it about 8 times in a row before they start trying to mimic, but you can see them paying attention and thinking about it. 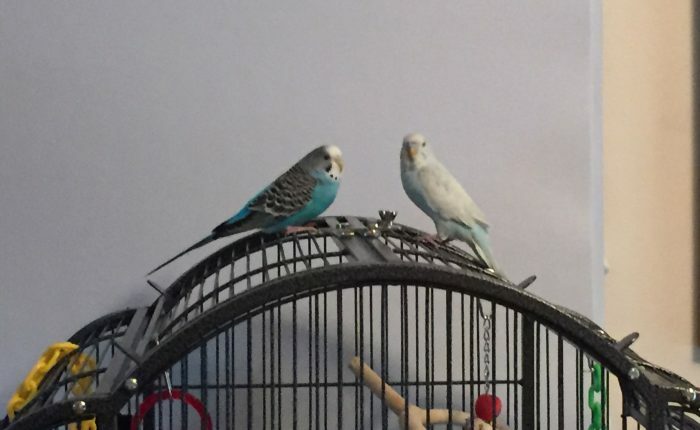 We haven’t had any big successes yet, but we have the two least melodic budgies ever, so yours will probably do better! 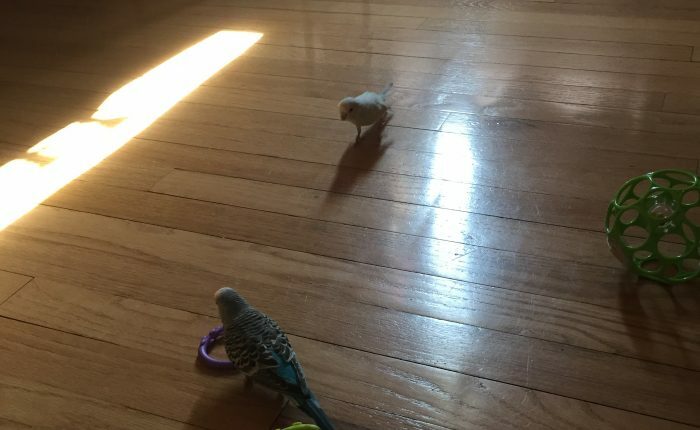 Come find me – If you have a flighted parakeet who can be trusted out of his cage alone for short periods of time, leave the room and call to him to come find you – Toby will methodically fly around the house seeking us out and she’s always so proud when she reaches her goal! 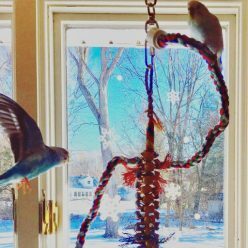 As long as you’re introducing new objects and concepts you are doing a great job enriching your parakeets and keeping their lives interesting. Even something as simple as a water bottle or a piece of paper can keep a budgie’s mind active and engaged. Finally it was time to bring Kelly home. We picked her up at the Rensselaer Bird Center and bought the below travel carrier while we were there, since the carrier we had previously purchased (A and E Cage Co. Soft Sided Travel Bird Carrier ) was regarded as a potential house of horrors by Toby, who would not go anywhere near it. The RBC was kind enough to send us home with about a pound of the food that Kelly had been eating and recommended that we offer her food and water bowls on the floor of her cage, in addition to the bowls higher up, because she was used to ground feeding. I can’t say enough about how amazing the RBC was at answering our questions and giving us tips on easing Kelly’s transition and how to handle introducing the two of them. Off we went with our new baby. It was a totally different experience, Kelly seemed unfazed by everything, she enjoyed looking out the car windows from the safety of her carrier and was relaxed the whole way home. Once we arrived home we put Kelly in her starter cage, we always intended that Toby and Kelly would move in together, but worried that Toby might be territorial since she was used to living alone. Because we had seen so much of Kelly and knew her to be an adaptable and fearless gal we expected she would have an easier transition than Toby, but it was actually very similar. Kelly sat in the same spot for about 8 hours without moving and then made her way down to find her food just before bed time. 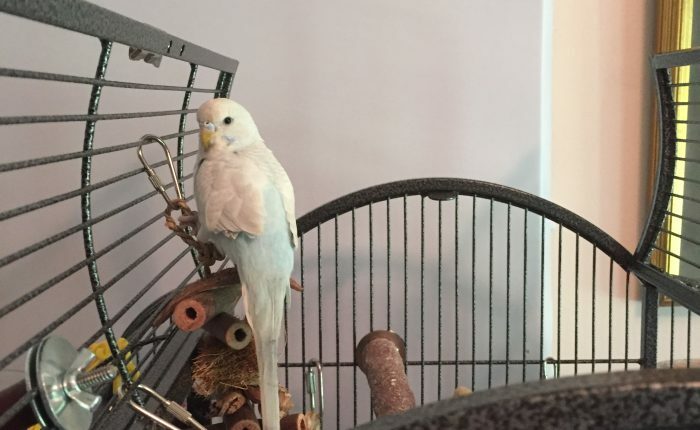 Based on our experiences I recommend bringing home a new parakeet as early in the day as possible so they have time to do the “sit and stare” and then relax a little bit before going to sleep in a strange place. Toby – who we thought might be terrified of another parakeet given her fearful nature was immediately entranced by Kelly. She stared at Kelly for hours, no signs of fear or aggression, just fascination. We did notice that for the first few days Toby really packed in the food, as though Kelly was somehow going to steal it from the other cage. The first day we keep them both inside their individual cages, Toby had gotten her last flight time as an only child earlier that morning and we thought seeing each other was excitement enough for day one. Our plan was to have them out separately for the next few weeks so they could get to be friends in a more controlled way. It didn’t work out; Toby would get over stimulated and bite Kelly’s feet through the cage bars constantly, no matter who was in or out. Kelly apparently either enjoyed it or didn’t have the sense to stay towards the middle of her cage and so the pattern continued. It was very upsetting for me to watch, but they were both perfectly happy to keep doing it. In order to save Kelly’s feet from excessive chomping we only waited a couple of days before bringing them out at the same time, with the hope that Kelly could at least defend her feet or hop away a bit better. Of course that raised other concerns about Toby have a clear advantage in being able to fly, whereas Kelly had been clipped pretty thoroughly and could only try to take flight and then sort of crash land with no control over her course. Toby was quite over-excited the first few times they were out together, she would attack Kelly and then fly away repeatedly. No one sustained any damage, but I did break up a couple of fights, even though I knew they had to sort out who was going to be the top bird, it was too hard to watch. Over a week or so Toby calmed down and they were able to play on the play gym at the same time, or hang out on the window perch without a constant battle for dominance. The next issue was that Toby got very intent about wanting to be with Kelly all the time, and if she couldn’t spot Kelly in the other cage he would flock call to him loudly and incessantly. Have a mentioned that Toby is a little intense? She’s earnest and sweet, but tends to be serious and utterly determined and does not let things go. She was mad at my husband once for months due to a minor infraction. 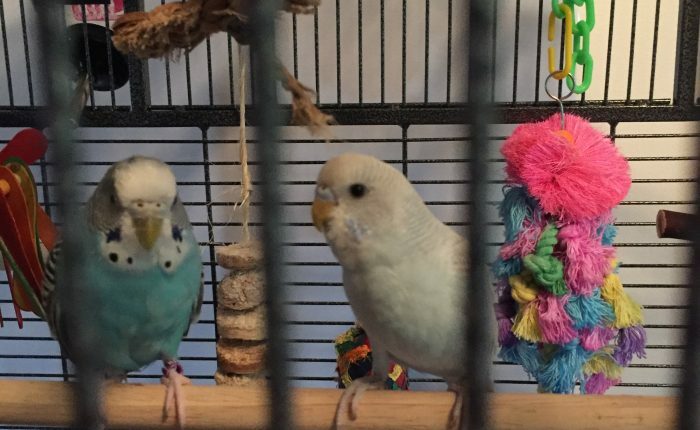 We had let Toby and Kelly want out in each other’s cages and it went well, and then one day when my husband was home from work he decided to just rip off the Band-Aid and move them in together. It was way earlier than we anticipated, but she was right, it was time. Toby felt much better having a roommate and was able to relax, as much as it’s possible for her to! Kelly had been used to living with her siblings at the bird center so didn’t mind having company, and was glad to move up to the bigger cage. I know that we are all happier for having added to our family. I’m sure some parakeets are perfectly fine being solo but Toby was absolutely not one of them, I know she’s enjoying life a lot more now, and we are really glad we took the chance! After about seven months with Toby as a solo parakeet I was pretty certain that we needed to add in a friend for her, but not everyone in my household was convinced. 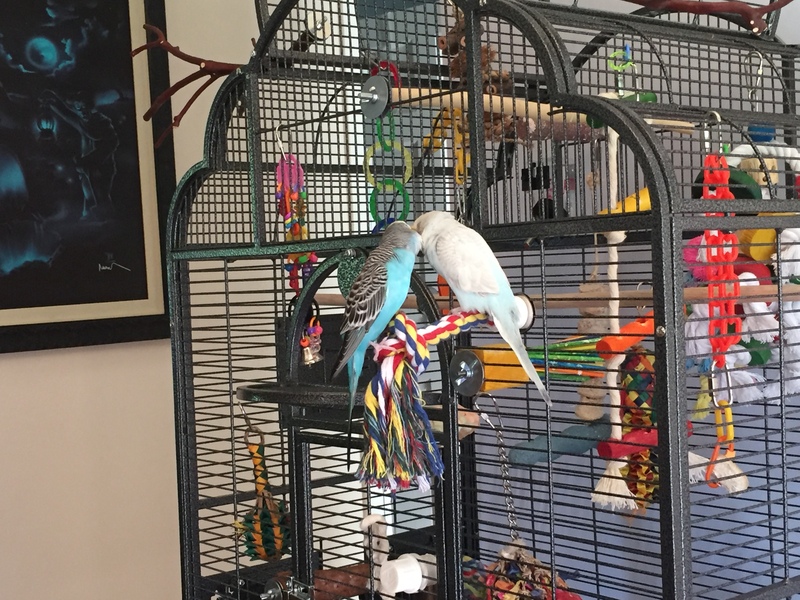 My husband was concerned that two parakeet should be way too much noise and upkeep. Even though Patrick was staunchly undecided with leanings towards “absolutely not” I went ahead and started looking for hand fed parakeet breeders in our area. I knew that I didn’t want to devote another month (minimum) to taming a parakeet, and a hand fed baby would already be comfortable with humans and being handled. After looking around on Craigslist and doing some Google searching I hadn’t come up with any solid local breeder leads. I remembered that while we were at Petsmart picking out Toby we had been approached by another customer and we talked about birds for a while. She indicated that the best resource in our area by far is the Rensselaer Bird Center, which is a few towns over from where we live. So – I told Patrick that we should do some recon, visit the RBC and ask if they knew of any local breeders, and to my surprise he agreed to go. That weekend we fired up the GPS and off we went, walking in to the RBC for the first time I felt a bit like I had gone to heaven, we immediately saw a senegal and a timneh grey hanging out on top of some cages, and after we tore our eyes away from them we realized there were birds everywhere of all shapes and sizes. Some of them were for sale, some were boarders, and many had come with their owners just to hang out. For someone like me who’s obsessed with parrots but doesn’t get a lot of face time with them it was a really magical experience. Also, everyone in the store was incredible nice, warm and friendly; we couldn’t even tell the difference between the staff and the customers because they were all so welcoming. We we were greeted by someone who asked if we needed help, I explained I was looking for information on local hand fed parakeet breeders and she said…. YES, yes I do, thank you 🙂 we were led into a back room with an incubator full of tiny fluffy parakeet babies, most of who were on a very strict feeding schedule. The woman offered to put all of the babies that were old enough into a small bin so we could sit with them and pick one out. How could we possibly say no to that? 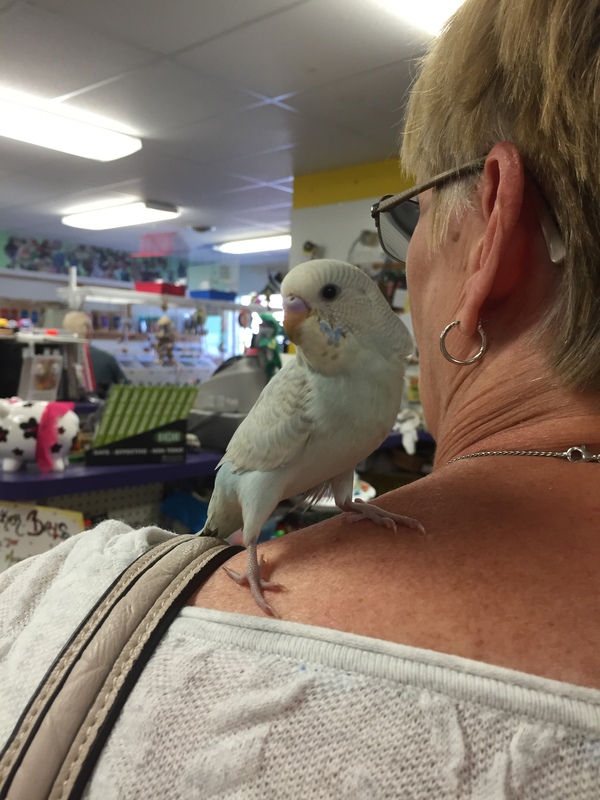 Patrick ended up picking out our parakeet; he was immediately drawn to the oldest baby, who seemed regal and not at all timid or afraid. Kelly very much still has an air that, even though she may occasionally deign to be silly, she is quite above us all. We were able to come back as often as we liked to get Kelly used to us, which was amazing, and I brought my mom and stepdad over once too so they could meet our new family member. Knowing that we would be able to take her home in 3-4 weeks gave us ample time to get prepared, and we were sure to set the cage up and put it near Toby’s cage to help her get the idea that there might be a next door neighbor on the way. I sort of expected some blowback from Patrick since he was railroaded into getting the new parakeet (even if it wasn’t my fault! ), but once you see a bucket or baby parakeets you just can’t say no. Finally it was time to bring Kelly home, get her settled in, and then worry about how the introduction to Toby would go – which is coming up in another post. There came a time we had to admit we just weren’t satisfying all of Toby’s social needs, and likely there was no way we could. Additionally, we had created a situation where Toby felt responsible for being the leader of the flock, and it was clearly putting a lot of pressure on her trying to control and protect us. The larger cage alleviated some of her frustration, but still, once she was out of the cage she wasn’t enjoying things as she had before. Instead of playing on the play gym or watching out the window, she would spend most of her time out repeatedly flying into our faces, and she had begun biting a lot more. She also developed the habit of landing on my glasses and biting my eyelids. The intensity of her interactions with us was heightened, not that she wanted to hurt us, just that we weren’t doing the right thing that would make her feel comfortable. This happened every single time she was let our of the cage, unless you could engage her with a treat or a toy, and even that wouldn’t last long. We both had to admit that being around Toby wasn’t too much fun for us anymore and she seemed to be pretty unhappy too. I am sure that some of it had to do with spring-time bird craziness, but more than that it really seemed like Toby needed something from us that we couldn’t provide, and her focus on us needed to be split onto someone else who would be able to reciprocate in ways we couldn’t. I didn’t want to go through the whole process of taming a Petsmart parakeet all over again, I felt that with Toby in the house it would be way too difficult to split our attention evenly between taming someone in one cage (a huge time commitment) and making sure that Toby didn’t lose out on any of our attention. So, I started researching hand fed parakeets, which are fed by humans in their first weeks of life instead of by their parent parakeets. This doesn’t necessarily make them socialized, but by the time you take a hand fed parakeet home it does not think you are a predator, which is a huge leap! Finding and bringing home Kelly is a story for a different day, but her presence in the house immediately helped Toby find balance and, I think, really helped Toby feel secure. Even better, Kelly is naturally dominant and self-assured, which took a lot of pressure off of Toby. Initially we felt so sure that we wanted to just have one parakeet, even after reading all of the evidence that parakeets are flock animals and really shouldn’t be solo pets. I still don’t regret the way we went about it, easing in with one parakeet and developing that strong bond was an experience I wouldn’t trade, but I can say that I now believe parakeets are not meant to live alone, they need other birds to feel secure and socially fulfilled, no matter how strong their flock bond is with the humans in their lives. We made tons of mistakes as new parakeet owners, but one night we managed to make pretty much all the mistakes in about a 45 minute period. It was about one week after Toby came to live with us, and everything had been going great, we’d made a huge commitment to spending time sitting near her cage talking to her, and we had even begun putting a hand in the cage to let her adjust to us and get to know our hands as friendly visitors. Our first major fail had been ongoing up to that point, we hadn’t been taking very much care to make sure Toby went to sleep early. Currently, both birds start relaxing with the curtains closed at about 6:00pm and we start dimming the lights at 7:00pm. On the night in question, however, I arrived home about 8:30pm and the house was still brightly lit and Toby was playing while watching Patrick make his dinner. I hung out with Patrick in the kitchen and we get on the subject of some changes we thought would really enhance Toby’s experience in the cage, and then we made the extremely poor decision to make those changes that evening. To contrast, now when we make changes in the cage we always do it in the morning so the parakeets have a ton of time to adjust before bedtime, you really never know what’s going to freak them out. To my recollection we had decided to switch around two perches so Toby could get around more easily, as she was struggling with learning to climb around on the cage bars. Patrick’s hands went in first and I kept a close watch on the door – Toby went to a corner and seemed totally fine (in retrospect, Toby seemed like she was absolutely terrified). Patrick ran into a snag in moving one of the perches and I made the critical error – putting one of my hands in the cage as well. Toby immediately decided her chances for survival were greater outside the cage and bolted for freedom. Now what we had on our hands was a fully flighted, completely terrified, mostly feral parakeet lose in the house. She didn’t trust us, she had no training in sitting on our hands, she was not skilled enough to be able to get back in the cage even if she wanted to, and worst of all, she had no experience with millet or any other treat and we had no method of coaxing her to us and then back in the cage. Imagine trapping a sparrow, putting it in your house, and then trying to convince it to enter a very specific, small doorway. Oh and also it’s 9pm at night. I shut every door possible, but this still left Toby with the hallway, kitchen, dining area, and living room. All I can say about what happened after this is we basically lost our minds for 30 minutes. In a total panic we followed Toby around the house trying to catch her with our hands, throw a towel over her (!!! so glad that didn’t work), or just generally tire her out enough to grab her, which was a total joke. She ended up on top of the refrigerator, the living room curtain rod, behind/underneath the entertainment center, inside a sound panel suspended from the ceiling, and everywhere but on us. I’m sure it seemed like all her nightmares come to life having two huge predators chase her around and roust her out of whatever refuge she took. I finally grabbed a sheet and used it to shepherd her into the kitchen/dining area and away from the living room. She even landed on top of her cage a few times but just had absolutely no idea how to get back in – which I’m sure she desperately wanted to do to get away from us! In retrospect I have no idea why we panicked so badly – there was really no time urgency and yet we behaved as though we had to get her back in the cage immediately. It would have been much better to take a step back and give her 15 minutes to calm down and think – or at least for us to calm down and think. She finally perched on top of a stained glass window in our dining area and stayed put. At this point a lightbulb went on for me and I said “you know, I’ve read that if you press your finger into her tummy she will have no choice put to step on it”. Toby eyed us warily as we lifted her entire cage onto the dining room table with the door facing her. Then Patrick approached gingerly and pressed his finger lengthwise against Toby’s stomach, right above her feet. She immediately stepped up and as we all held our breath, Patrick conveyed her about two feet into his cage and shut the door. The ordeal ended with Toby cowering in the corner of her cage until she went to sleep and Patrick and I having a stiff drink to wash down our shame. We were ultimately fortune that Toby didn’t trust us at all yet, otherwise I’m sure we would have broken that. As it was we didn’t notice any change in her behavior the next day, just a lot of changes in us and a lot more respect for her boundaries.